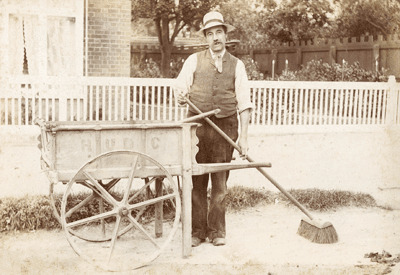 The Road Sweeper pushing his single barrow is a common sight in cities and towns around the UK, not noticed as he quietly makes his way around his "barrow beat". 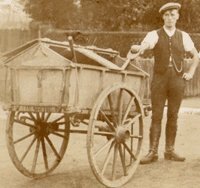 The tools of this trade having changed little since Victorian times, the barrows are lighter with the use of plastic and alloys, the addition of the "litter-picker" being the latest tool in his arsenal. 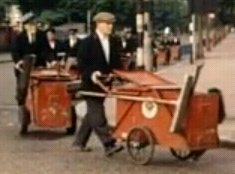 There are numerous machines used in street cleansing today, but, they are limited in what they can do in the congested city streets, so, the "single-barrow" still plays an important role in many local authority street cleansing operations. 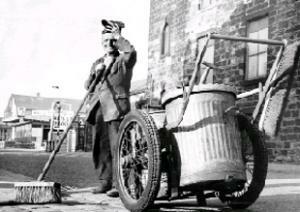 Much maligned, little appreciated, sometimes the victim of abuse and street crime, the road sweeper's role is not an easy one, probably the only well-known UK road sweeper being Trigger from "Only Fools and Horses". Working outside in all weathers, you will need to be physically fit and not easily angered by the public who will think nothing of dropping litter on your newly swept pavement. There is a lot of job satisfaction as you transform an eyesore to a clean street, you may even get praise from the public for your hard work. There is much camaraderie between street cleansing staff, you're all in the same boat and may need to help each other out when situations arise. The busiest time of year is the "leafing season" from September to December, it is at this time of year that temporary staff are usually taken on to cope with the extra work, even outside this period trees drop leaves, branches, blossom, seeds and fruit in abundance, a tree-lined street looks nice, but, can be hard work all the year round. With many local authorities contracting out their street cleansing to the private sector the usual benefits assoicated with working in the public sector no longer apply. Most road sweepers start as agency workers on minimum wage, even in London (so much for the London living wage many full-time sweepers in London still do not earn this). If you are considered to be a good worker you may eventually get a permanent job, don't hold your breath, you may have to work a few years before getting permanent status. Legislation covering agency workers may improve their lot. Most employers are very strict on "health and safety", they cover themselves well, any injury you sustain at work will be your own fault. Uniforms are supplied, although safety boots may not be supplied to agency staff. Hi Viz - jacket or waistcoat. 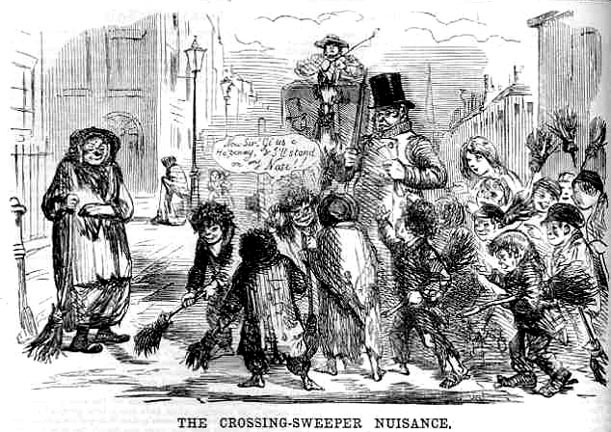 19th Century "crossing sweepers" were sometimes little more than beggars who would sweep a path across the dirty city streets for the well healed. Often considered a nusuiance.